Tomas Alfredson’s amazing Swedish film cannot be pigeonholed into a single genre. It is not horror nor fantasy, although the film contains elements of both. Most of all, this is a dramatic and unconventional love story between two children. But don’t think Twilight – this is a serious film, produced exceptionally well and delivering at the highest levels in all departments. 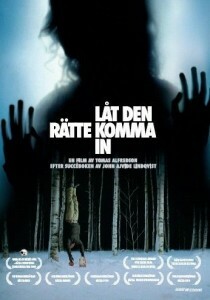 Let The Right One In is based on John Ajvide Lindqvist’s equally superb novel. Lindqvist himself adapted his story for the screen. You can find more information on this Swedish-language movie on Wikipedia and IMDb. And with that ending that manages to be both optimistic and sinister at the same time. Whilst it great to see Oscar’s safe and protected, there’s also the worry he’s the new Hakan, indeed it’s possible to imagine the story essentially replaying itself fifty/sixty years earlier with Eli forging a similar relationship with Hakan as a child. A fine summing up of a brilliant film (and for once, I thought the English language remake was fine also). I absolutely love this film. Definitely one of my favorite vampire films of all time. This is in my top ten films of all time. A sublime piece of cinema. This movie is definitely in my top ten list of best films of all time. The honesty and depth of the two lead actors had me gripped from the start and I felt that the story had so many layers, it left me and my friends with lots to talk about after. We had a good debate about what the ending meant. I’ve watched this film several times and it was great each time. Excellent movie!! While I can appreciate Fincher’s remake attempt… it can’t touch the original. A truly beautiful film. It was Matt Reeves who remade the film as Let Me In (2010). You’re thinking of the remake of The Girl with the Dragon Tattoo , I guess! …?! Thx. Two films that did not need a remake. I agree, the film is not on a particular subject but it is a great mix of all. The balance of thriller and horror with a cute love story is perfectly shown in it. I think it’s a first multi genre film. I have watched it in Swedish language but its screenplay is so simple and effective that I have understood it well. Kåre’s acting is good but Lina Leandersson has played her role really well, her performance is engaging. But at the last, their love story is more appealing. Most films are entertaining but this one is different, like it feels good while watching it. Overall, I really like it (watched it 3 times), and it is an example of real cinema.